Mark Varney (Legato Records) has written of him: "Wow! Makes my fingers feel arthritic!" Antonello Giliberto was born in Siracusa (Sicily). He studied the guitar in earnest eventually taking lessons from Alfredo D'Urso in 1992 and 1993. During this time Antonello was influenced by the rock bands of the day before his musical direction and productivity took a new path largely thanks to the works of Johann Sebastian Bach - most notably the movement "Air". From them on Classical Music played a large part in Antonello's life and his music reaped the benefits seeing tonal modes coming into play. To this day J.S. Bach has remained a huge influence. Another artist that had a huge influence on Antonello was Yngwie Malmsteen with "The Seventh Sign" being a life changing experience. It was here that Antonello started to incorporate sweep arpeggios into his vocabulary. So he began to listen to musicians like Joey Tafolla, Vinnie Moore, Tony MacAlpine and all other neoclassical guitarists since he has known Jason Becker. Antonello immediately became involved with Jason's music, his way of playing and, above all, his life. He is fond of music of all different kinds: jazz, rock, fusion. In 2005 he went on enrolling on Guitar Academy courses (which is a prestigious Sicilian Academy specialized in modern guitar) taught by Andrea Quartarone. After the acquisition of the first and second degree of fusion guitar, he joined the teaching staff at the Guitar Academy. Now, he is intensely engaged in teaching at the same school, in Catania, Siracusa, Ragusa, Solarino and Palazzolo Acreide. Moreover, he attended several clinics held by Richard Smith (Catania 2005) and Carl Verheyen (Catania 2005). He got the first qualifying degree in rock-fusion guitar. In 2006, 2007,2008, 2009 and 2011 he attended the "ESC" (European Summer Campus), in Siracusa, where he followed the guitar courses held by Allan Holdsworth, Kiko Loureiro, Richard Hallebeek, Paul Gilbert, Kee Marcello, Richard Smith, Robben Ford, Greg Howe, Carl Verheyen, Guthrie Govan, Greg Koch, Andy Timmons and the theoretical, harmonic and ear-training lessons held by Andrea Avena, writing articles for AXE, the best guitar magazine in Italy. In April 2010 he has participated in the second edition of the Guitar Day to Bucharest (Romania), studying with Brett Garsed, Greg Howe, Michael Angel Batio, Richard Hallebeek, Andy Timmons and William Stravato. In the number July / August 2010 of AXE magazine is present one article of 7 pages really on the seminars / concerts kept in Bucharest, with transcripts of the involved guitarists. August 6 th 2010 it has participated in the first edition of the "Night of the Guitars", event held in Palazzolo Acreide, with some of the best Sicilian guitarists. From October 2010 he collaborates with the CQUADRO Guitar Works, refined handicraft laboratory of guitars, of which he is official endorser. Since June 2011 he became the official endorser of pickups Mama, the best pickup craft in Italy. He opened as a soloist, at the Guitar Night 2011, the concert to Kee Marcello (Guitarist of Europe). On July 18, 2011 he played at the first edition of Sicily Guitar Day, an event held in Mazarino, where he also demonstrated the guitars CQuadro. Has had many collaborations with Sicilian bands like the "Flowers' Grandsons', with which it has taken an average of about 100 concerts a year throughout southern Italy. From July 2011 to August 2014 he collaborated with the band Blue Train, playing rock-blues throughout southern Italy, and publishing an album entitled "Madness". December 17, 2011 he obtained brilliantly his diploma 3rd level fusion at the Guitar Academy, examined by one of the best Italian jazz musicians: Antonio Tosques. December 23, 2011 he played with the Blue Train Trio in the presence of the great motocross champion Antonio Cairoli, to whom he also dedicated the song "222" included in the album "Madness". April 13, 2012 he participated in the masterclass of the great jazz musician Stanley Jordan. April 26, 2013 he released his first solo album: "The Mansion of Lost Souls". The CD is heavy, dark and very influenced by classical music, with a mix of strong melodies and ferocious riffs metal! "The Mansion of Lost Souls" is the house of 12 tracks full of guitar abuses! On 12 October 2013 he has been fortunate to study with Andrea Martongelli (Arthemis) and the great Gus G (Ozzy Osbourne, Firewind). 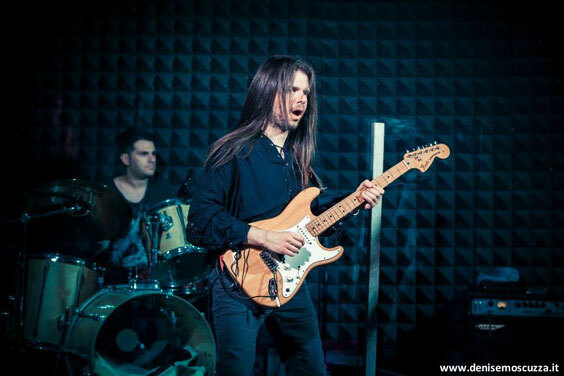 Since April 2014 he collaborates with the power metal band Steelblade, with whom he performed at Sicily Metal Camp in August 2014. In the same festival he collaborates with the thrash metal French band E-Force, led by former Voivod Eric Forrest. June 13, 2014, with the Steelblade band, he opens the concert at the Italian rocker Pino Scotto. In July 2014 Antonello has finished composing his second instrumental album ... 10 songs full of shred, melody and pathos! Since November 2014 he collaborates with the historic Italian thrash-metal band Schizo, which will play live in 2015 in support of the new album "Rotten Spiral". In December 2014 he recorded some solos on the new album of E-Force, invited by Eric Forrest in person. He also collaborates with the tribute band Deep Purple / Rainbow "Purpleized", with Tony Carey (ex-Rainbow) on keyboards, which he will play on tour in the spring of 2015. In April 2015 he attended the seminar held by Mike Stern and took lessons from the great shred guitarist Scott Mishoe. The new album by Antonello Giliberto will be titled "Journey through my memory" and will have a lineup of exception: the great shred bassist Dino Fiorenza and the legendary drummer John Macaluso. In May 2015 he signed for the historical record label Minotauro Records. On June 16 released the album "Demonickol" by E-Force, where Antonello plays on three songs. The new album by Antonello Giliberto "Journey through my memory" was released June 22, 2015. In July 2015 he appears on the album "Guitar Academy 2015" by Andrea Quartarone with the new song "Demeter". On 24 February 2016 he was a guest on TV in "Telesiculissimi" broadcast, in which he is interviewed and performs his song "Journey through my memory." In 2016 he began composing for his third instrumental solo album. The July 10, 2016 attends the seminar of Swedish guitarist Mattias IA Eklundh and opens his concert in Catania. Between December 2016 and January 2017 he records the guitars on three songs in the keyboardist Gabriels new album "Fist of the Seven Stars Act 2". On April 2, 2017 he participated in the msterclass of Vasco Rossi, Alice Cooper, and Y & T's guitarist Stef Burns. On May 26, 2017, Antonello announces that his third instrumental album will be titled "The Strategy Of Chaos". In August 2017 he is invited by Eric Forrest to play guitars on the track "Master of Morphine" for a tribute album to Necrodeath (For the BLACK TEARS / KULT OF CTHULHU label). In December 2017 he wrote the music for the short film "Taormina è amore" by the emerging artist Giorgio Nanì La Terra. In June 2018 he appeared in the international compilation GUITARRATÓNICA 2018 , along with great artists such as Atma Anur and David Shankle. In August 2018 he completed his third solo album "The Strategy of Chaos". Mark Varney (Legato Records) ha scritto di lui: "Wow! Makes my fingers feel arthritic!" Antonello Giliberto è nato a Siracusa e vive attualmente a Palazzolo Acreide (SR). Ha studiato chitarra classica prendendo lezioni dal Maestro Alfredo D'Urso nel 1992 e 1993. Durante questo periodo è stato influenzato da gruppi rock come Led Zeppelin e Queen, prima di spostare il suo percorso musicale verso nuovi sentieri, in gran parte grazie alle opere di Johan Sebastian Bach. Da allora in poi la musica classica ha giocato un ruolo importante nella sua vita e nel suo modo di suonare. Un altro artista che ha avuto una profonda influenza su Antonello fu Yngwie Malmsteen, soprattutto con il disco "The Seventh Sign". Grazie a lui Antonello cominciò ad incorporare nel suo vocabolario la tecnica "sweep" applicata agli arpeggi. Iniziò poi ad ascoltare chitarristi come Joey Tafolla, Tony Macalpine, Vinnie Moore e tutti gli altri chitarristi neoclassici del catalogo Shrapnel, primo fra tutti il grande Jason Becker. I generi maggiormente amati da Antonello sono il rock, il jazz e la fusion. Nel 2005 si è iscritto ai corsi della Guitar Academy studiando il programma di fusion con Andrea Quartarone. Dopo aver superato l'esame di primo e secondo livello di chitarra fusion, è entrato a far parte dello staff di insegnanti alla Guitar Academy. Tiene corsi di chitarra moderna presso le sedi di Catania, Siracusa, e Ragusa. Ha seguito i seminari di Richard Smith (Catania 2005) e le edizioni 2006, 2007, 2008, 2009 e 2011 dell'European Summer Campus a Siracusa, in cui ha avuto modo di studiare chitarra rock-fusion con Allan Holdsworth, Kiko Loureiro, Richard Hallebeek, Paul Gilbert, Kee Marcello, Richard Smith, Robben Ford, Greg Howe, Carl Verheyen, Guthrie Govan, Greg Koch, Andy Timmons e teoria, armonia e ear-training con Andrea Avena. Ha collaborato con la migliore rivista di chitarra in Italia "AXE" scrivendo i report su tutte le edizioni dell'ESC. Nell'aprile 2010 ha partecipato alla seconda edizione del Guitar Day a Bucharest (Romania), studiando con Brett Garsed, Greg Howe, Michael Angelo Batio, Richard Hallebeek, Andy Timmons e William Stravato. Nel numero Luglio/Agosto 2010 di AXE è presente un suo articolo di 7 pagine proprio sui seminari/concerti tenuti a Bucarest, con trascrizioni dei chitarristi coinvolti. Il 6 Agosto 2010 ha partecipato alla prima edizione della Notte delle Chitarre, evento tenutosi a Palazzolo Acreide, con alcuni dei migliori chitarristi siciliani. Dall'ottobre 2010 collabora con la CQUADRO Guitar Works, laboratorio di liuteria artigianale, di cui è endorser ufficiale. Dal giugno 2011 è diventato endorser ufficiale dei pickups Mama, i migliori pickup artigianali in Italia. Ha aperto come solista, in occasione del Guitar Night 2011, il concerto a Kee Marcello (Chitarrista degli Europe). Il 18 luglio 2011 ha suonato in occasione della prima edizione del Sicily Guitar Day, evento svoltosi a Mazzarino, in cui ha dimostrato anche le chitarre CQuadro. Ha avuto molte collaborazioni con band siciliane come i "Flowers' Grandsons", con cui ha tenuto una media di circa 100 concerti l'anno in tutto il sud Italia. Dal luglio 2011 all'Agosto 2014 ha collaborato con la band Blue Train, suonando rock-blues in tutto il sud Italia, e pubblicando un disco dal titolo "Madness". Il 17 dicembre 2011 ha conseguito brillantemente il diploma di 3° livello fusion alla Guitar Academy, esaminato da uno dei migliori jazzisti italiani: Antonio Tosques. Il 23 dicembre 2011 ha suonato con il trio Blue Train alla presenza del grande campione di motocross Antonio Cairoli, al quale ha dedicato anche il brano "222" contenuto nell'album "Madness". Il 13 aprile 2012 partecipa al seminario del grande jazzista Stanley Jordan. Il 26 Aprile 2013 è uscito il suo primo cd solista: "The Mansion of Lost Souls". Il cd è pesante, molto oscuro e influenzato dalla musica classica, con un mix di melodie forti e feroci riff metal! "The Mansion of Lost Souls" è la dimora di 12 tracce piene di abusi chitarristici! Dall'aprile 2014 collabora con la band power metal Steelblade, con la quale si esibisce al Sicily Metal Camp nell'agosto 2014. Sempre nello stesso festival collabora con la band thrash metal francese E-Force, guidata dall'ex Voivod Eric Forrest. Il 13 giugno 2014, insieme alla band Steelblade, egli apre il concerto al rocker italiano Pino Scotto. Nel luglio 2014 Antonello ha terminato di comporre il suo secondo album strumentale...10 canzoni piene di shred, melodia e pathos! Dal novembre 2014 collabora con la storica thrash-metal band italiana Schizo, con cui suonerà live nel 2015 a supporto dell'album Rotten Spiral. A dicembre 2014 ha registrato alcuni assoli del nuovo album degli E-Force, invitato da Eric Forrest in persona. Collabora anche con la tribute band Deep Purple/Rainbow "Purpleized", con Tony Carey (ex-Rainbow) alle tastiere, con cui suonerà in tour nella primavera del 2015. Nell'aprile 2015 ha frequentato il seminario tenuto da Mike Stern e ha preso lezioni dal grande chitarrista shred Scott Mishoe. Il nuovo album di Antonello Giliberto si intitolerà "Journey through my memory" ed avrà una lineup d'eccezione: il grande bassista shred Dino Fiorenza ed il leggendario batterista John Macaluso. Nel Maggio 2015 firma per la storica casa discografica Minotauro Records. Il 16 Giugno esce il disco "Demonickol" degli E-Force, in cui Antonello suona su 3 canzoni. Il nuovo album di Antonello Giliberto "Journey through my memory" è uscito il 22 Giugno 2015. Nel luglio 2015 appare sul disco "Guitar Academy 2015" di Andrea Quartarone con il brano inedito "Demeter". Il 24 febbraio 2016 è ospite in tv nella trasmissione Telesiculissimi, in cui viene intervistato ed esegue la sua canzone "Journey through my memory". Nel 2016 inizia la composizione per il suo terzo cd solista strumentale. Il 10 luglio 2016 assiste al seminario del chitarrista svedese Mattias IA Eklundh e apre il suo concerto a Catania. Tra dicembre 2016 e gennaio 2017 registra le chitarre su tre canzoni del nuovo disco del tastierista Gabriels "Fist of the Seven Stars act 2". Il 2 aprile 2017 partecipa al seminario del chitarrista di Vasco Rossi, Alice Cooper e Y&T Stef Burns. Il 26 Maggio 2017, Antonello annuncia che il suo terzo album strumentale si intitolerà "The Strategy Of Chaos". Ad agosto 2017 è invitato da Eric Forrest a suonare le chitarre sul brano "Master of Morphine" per un album tributo ai Necrodeath (Per l'etichetta BLACK TEARS / KULT OF CTHULHU). Nel dicembre 2017 scrive le musiche del cortometraggio “Taormina è amore” dell'artista emergente Giorgio Nanì La Terra. Nel giugno 2018 appare nella compilation internazionale GUITARRATÓNICA 2018, insieme a grandi artisti del calibro di Atma Anur e David Shankle. Nell'agosto 2018 completa il suo terzo album solista "The Strategy of Chaos".